We had to make difficult decisions about which of the many wonderful sessions to attend; there were food tastings and lectures and demos on food photography, story telling, cooking, and technical subjects to choose from. 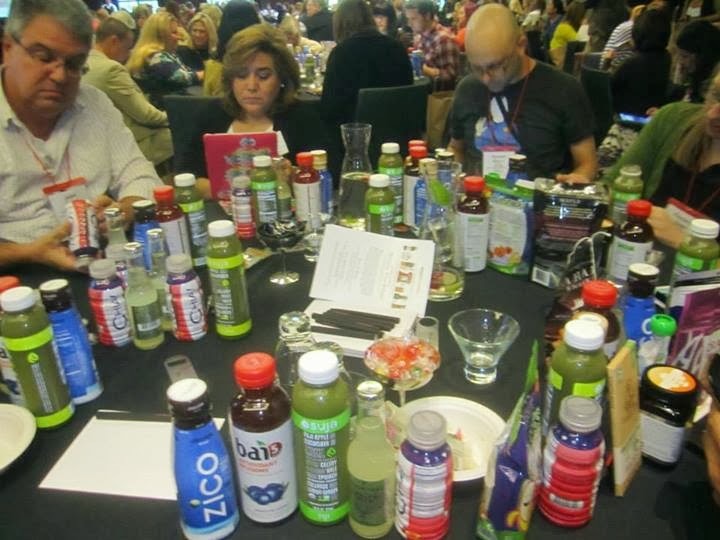 One reason the conference was such a bargain ($95 for bloggers who agreed to mention it three times) was because it gave companies a chance to introduce new products and to wine, dine, and woo us in hopes that we would recommend them to our readers. Since the event draws some of the world’s most successful bloggers, it is cheap advertising. Search for #IFBC2013 to see how well it worked! Sponsors, vendors, restaurants, and donors prepared and served meals and lavished us with ice cream, pastries, coffee, beverages, and snacks between sessions. They plied us with gifts and piled up mountains of freebies to stuff into tote bags, which they also provided. 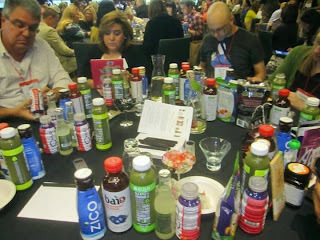 The picture above shows some of us sampling an assortment of items from the Live Blogging event sponsored by Amazon.com. We had three minutes to listen to a pitch about each product, taste it, and blog about it. Although virtually all of the products claimed to be healthful, organic, all-natural, sustainable, non-GMO, fair trade, and green, most of them were either grain-based or fructose heavy. There were a few real finds among the offerings however. Navitas dried dragon fruit was just that: dried slices of dragon fruit. 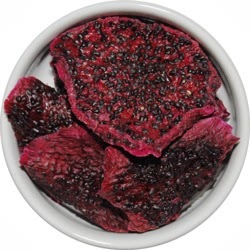 Dragon fruit is not naturally very sweet, but when dried, it was crunchy like dried figs. They also provided packages of very tart, dried gooseberries, euphemistically called, “golden fruit.” It’s easy to overeat concentrated fruit, but at least it was real food with nothing added. One average-sized piece of dragon fruit, weighing 1/4 ounce, contains 4.75 net grams of carbs; 1/4 ounce of golden berries (about 6) contain 3.5 net grams. Another gem among the junk was a fruit drink called Bai Antioxidant Fusions. Each 9-ounce serving had just five calories and one carb. It was sweetened with erythritol, stevia, and fruit juice concentrates and contained coffee fruit (the source of the aforementioned antioxidants, no doubt). 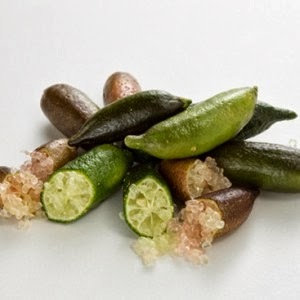 Everyone loved these odd little citrus fruits called, “finger limes.” The instructions on the bag said to cut them in half and squeeze the tart segments called “pearls” or “caviar” into drinks, onto seafood, or anywhere you would use lemon or lime. I cut them crosswise, put the cut end in my mouth, and bit down, starting from the tip, to pop the crunchy segments out. (Don’t you think kids would enjoy that?) Finger limes were discovered growing wild in Australia and have not been altered at all. The nutrition counts were not given on the website, but I e-mailed them to ask. * I’m sure they will be very low in sugar. IFBC’s grand finale was a surprise dinner at one of 25 of Seattle’s best restaurants arranged by Urbanspoon. We were divided into groups and taken to different parts of the city. We weren’t told where we were going, just which bus to board. I was part of the gluten-free and/or allergic group that went to Ray’s Boat House in Ballard where the chef had designed an incredible 5 course dinner for us that accommodated all our allergies and peccadillos. At the bottom of our menu it said: “Each menu item above has been prepared without dairy, egg, almonds, soy, grains, refined sugar, refined salt, beer, berries or grapes. This menu is gluten free, low carbohydrate and suits those following the Paleolithic diet.” We were treated like royalty and at the end of the dinner we were handed yet another tote bag, this one with coupons for some of the restaurants and a big, beautiful cookbook authored by one of the chefs. This dinner alone was worth many times what we paid to attend the convention! The 2013 IFBC agenda is on the Foodista website here. They are now taking reservations for 2014. They sold out quickly this year, so sign up if you want to secure a place. *Post Script: I heard back about the nutrition data for the finger limes. One package (40 grams) has 4g of carbs, 2 of which are fiber. It has 20 calories, 65 mgs of potassium, 25% of the recommended daily intake of vitamin C, and 2% of the calcium. Dorie Greenspan, Dragon FRuit, Finger Limes, Golden Berries, IACP Conference, Ray's Boat house, Seattle. Bookmark. What an experience and what an amazin restaurant you were taken to – that's truly different!! Yes, it was amazing. I took pictures of my plates at Ray's Boathouse, but they are still in my phone. Everything was gorgeous and delicious, in spite of the challenge of cooking for a group who had all sorts of special requirements. Wish you could have come. DJ says he's coming next year and I expect Carolyn to come again too. Lucky me, it will be in Seattle again in 2014! Manuka honey is the only brand I will use from now on. It is a little more expensive but well worth it. Hi Rhianna. Manuka is the kind of honey, not a brand. "Manuka Doctor" is the brand name of the one I reviewed here, but there are others. The active strength, denoted by a number, will vary from one brand to another; the higher the number, the more potent it is and the higher the price. It is an amazing product! I have the Manuka Doctor number 25 and it did cost quite a bit but it lasts so long and in my opinion is is well worth it.